Sport is all about drama. The kind of drama that comes when a winning goal is scored, the deciding point is played, or the champion crosses the finish line. Lighting can illuminate this drama but, traditionally, it doesn’t add to it. Now, that’s all changing, thanks to technology that’s making stadiums smart. If you’ve ever been to a stadium concert, you’ll know that these shows routinely use dramatic stage lighting effects as part of the entertainment. In a smart venue, the whole stadium is the stage. Imagine arriving at your seat in the build-up to a game, with light effects contributing to the party atmosphere. Suddenly the music goes silent and the lights dim, with the pitch in complete darkness. A voice announces the teams and a single beam of light illuminates the players as they emerge from the tunnel. The crowd goes wild. 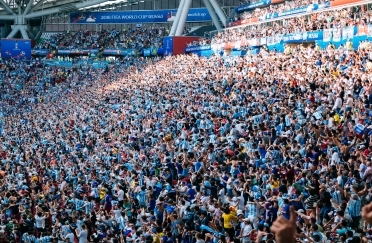 This kind of thing is possible in smart stadiums, which use cutting-edge technology and connectivity to take the fan experience to a new level. These venues incorporate Wi-Fi throughout, and use cameras, sensors, cloud technology and connectivity for crowd management, ticketing, energy saving and building automation. According to Research and Markets, the smart stadium market is set to grow from around $4.6 billion today to $12.5 billion by 2023. LED lighting and controls allow an unprecedented level of precision control over lighting in stadiums, creating dynamic effects that build a sense of theatre before, during and after a game. 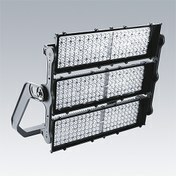 This doesn’t just apply to pitch lighting but also to spectator areas, hospitality areas, entrance areas and facades. 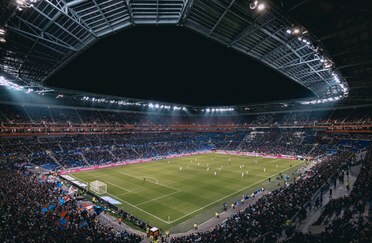 Better, smarter lighting benefits players, fans and broadcasters, with better quality illumination and visual comfort, glare control, great clarity and colour for high-definition broadcasting, no flicker in slow-motion replays, and the ability to enhance the overall experience for spectators. Even for smaller venues that host recreational sports, the advantages of LED lighting solutions over traditional lighting are clear: it’s more energy efficient, easier to maintain, able to recover immediately after a failure, and allows light to be distributed and controlled more easily. Thorn’s Altis LED is one example of a luminaire designed specifically for sport and area lighting, which can be part of the smart stadiums of tomorrow. Altis LED offers excellent performance and high uniformity levels, from a minimal number of light points, and has been used at venues including the Danube Arena in Budapest, the PalaTrento arena in Trento, Italy. Altis LED scores 90+ on the TLCI (Television Lighting Consistency Index), which broadcasters use to evaluate the performance of lighting for television, and it enables TV broadcasters to film super-slow-motion replays with no visible flicker. With flicker of less than 1%, Altis surpasses the requirements of sporting bodies like UEFA and the UK’s Premier League, and the draft European sports lighting standard. It’s products like this that are helping venues transform the experience of live sport. At the sporting events of the future, the light won’t just allow fans to see the action, it will become part of the action.